In today’s “Everything Old is New Again” news, Freeform has picked up an immigration-themed Party of Five reboot. The original Party of Five featured the very ‘90s storyline of the (five) Salinger children learning to fend for themselves after a drunk driver killed their parents. Now, the Salingers are getting swapped out for the Acostas, whose parents aren’t dead, but did get deported to Mexico. 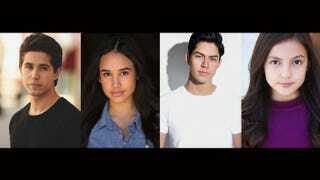 The new cast will feature t as Emilio, Emily Tosta as Lucia, Niko Guardado as Beto and Elle Paris Legaspi as Valentina. The series, which will be 10 episodes long, was co-written by Chris Keyser, Amy Lippman, and Michal Zebede. Next, I prophesy a reboot of My So-Called Life featuring a cast of fetal YouTube stars, or a Freaks and Geeks reboot filmed exclusively in Instagram Stories. Actually, that last one would be fine.